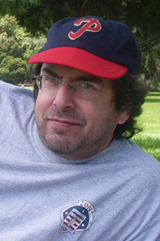 Jeff Polman is a magazine production artist, journalist, and produced screenwriter who enjoys spreading the lure and lore of his favorite pastime on the Internet. Using Strat-O-Matic Baseball as a gameplay template, his previous fictionalized replay blogs were 1924 and You Are There! and Play That Funky Baseball. He lives and rolls his obsessions in Culver City, California and can be contacted here.